FCS understands the financial commitment of private Christian school can be a strain on the family budget. Fortunately, FCS has been blessed with the ability to provide certain scholarships, discounts, and financial aid to our families who qualify. Families interested in applying for financial aid will do so through FACTS To access the application simply click on the button below. 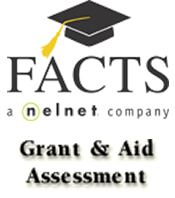 FACTS does charge a $30 application fee at the time of application. Once your application is complete and all supporting documentation received, FACTS will send Faith Christian School a report regarding eligible aid. The application period for 2018-2019 school year opens January 5th. The initial application deadline is April 15th and notifications will be sent by May 1st. Applications submitted after April 15th will be considered on a case by case basis depending on funds available. All FCS tuition/daycare accounts must remain current. Families receiving aid will be required to enroll with FACTS under the ACH option. There are several ACH payment plan options to choose from. If you are not already enrolled under this option, enroll now by logging in to your Parent's Web account. Must support FCS main fundraiser, "Foundations of Faith." Faith Assembly of God provides a scholarship for the students of families who are active members of its congregation. For more information about this scholarship and how to qualify, please contact the Admissions Office. To be eligible for this discount you must meet one of the above criteria. For more information about these discounts, please contact the Admissions Office. Note: Only one scholarship/discount may be applied per family and cannot be combined with financial aid.